This is a Mirecourt, France c1880 made instrument, probably of the Claudot school. It would be extremely hard to say who actually made this bass. 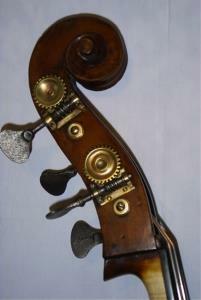 It is viol shaped with a flat back. The condition is very good. It has a very quick, big sound, which is very well suited for Jazz musicians, though it can be quite successfully played in a classical mode.